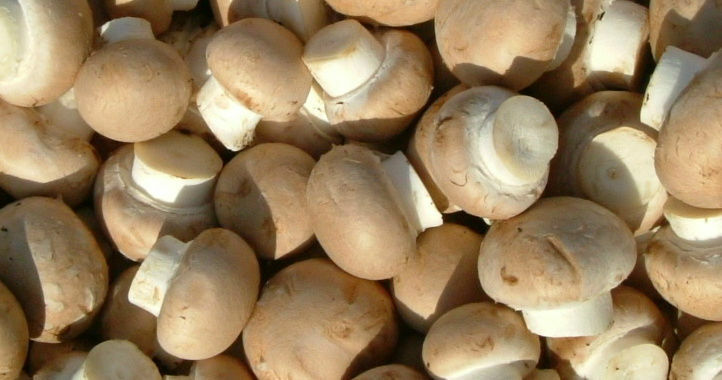 C 9 produces a medium to large-sized, solid mushroom of 30 to 70 mm in diameter with a brown coloured cap and white stem. This strain produces mushrooms for the fresh market of an extraordinary quality with a long shelf-life. C 9 brown mushrooms have a distinctive flavour. This strain suits very well to produce large open Portobello mushrooms. This brown strain prefers not wet, well fermented composts and needs an incubation duration of at least 14 days or longer. The mycelium run in the casing soil after fresh-air is very strong and it needs therefore an early aeration. The ambient temperature at pinning and cropping should be 17 oC. or lower. Too early watering on pins can be negative but watering on fruit bodies during the flush is favourable. Can be grown well alongside hybrids like F41 in the same room. C 9 prefers well fermented composts with not high moisture contents of between 65% and 68% at spawning. Under composted substrates and ammonia rests at the moment of spawning are negative for this strain. Spawn rate is 5 to 6 litres per tonne of fresh compost or 8 litres per tonne of pasteurized compost. The first 10 days after spawning the mycelium growth is not very strong but after 12 days it gets more white and strong. The optimal average substrate temperature is 26° C., but compost temperature temporary over 30 oC. have no negative effect with this strain. Incubation duration should be at least 14 days. Brown strains are very susceptible for watering mistakes, therefore it is advisable to use a good water holding casing soil with a coarse structure. Too fine casing, results in over pinning and small mushrooms. Cac’ing with incubated compost or the use of CMS cac’ing spawn in the casing with the C 9 variety will give greater accuracy of crop timing and less uniformity of the first flush. Pin-setting is easy with this variety. Because of the fast mycelium growth of this strain it is necessary to start fresh air early. Decrease the air temperature in two days to 17 °C. In the case of overlay it might be necessary to knock back the mycelium with halve a litre per m within two days after the start of aeration. Compost temperature decreases to about 19°C. Keep the Relative Humidity during the first 5 days at 92% or higher, CO2 content varies between 1000 and 2000 ppm depending on the outside climate. After the pins have formed, R.H. should be reduced to induce evaporation from the casing soil surface. Pins are susceptible for early watering at not drying circumstances. So watering should not commence until pins are large “pea-sized” and should then be continued several times even at picking days. Do start picking the first mushrooms early to make space for the coming fruit bodies because the growth is very fast. If the first flushes are coming too uniform than raise the air temperature at about 6 days after the start of fresh air like the growing proposal shows. Before the first flush the air-temperature is decreased to 16 °C to maintain quality. Do increase the air temperature CO2 and R.H. at watering at the end of the flush for re- pinning. Heavy watering’s should be avoided on later flushes. Most important in order to get a good third flush is a soft and moist casing soil layer at the end of the second flush. Therefore a good watering at the end of the second flush is necessary. Keep the air temperature low at 16 C. and reduce the fan speed.